It is undeniable to anybody who simply knows the name of Napoleon that he was a military genius. In a few years, the Emperor managed to conquer the majority of Europe, dividing it between the French empire and satellite states. What most people ignore however, is Napoleon’s life long wish and efforts towards a durable peace in Europe and in the world, as reflected in his correspondence. Let us start this journey in the life and mind of Napoleon in 1797. Napoleon is only 28 years old and already a famous and renowned General. Europe is in the midst of the War of the First Coalition, that is, a coalition made up of most of the European monarchies (namely, the Holy Roman Empire, the Archduchy of Austria, the Kingdom of Prussia, the Kingdom of Great Britain, the Kingdom of Spain, the Kingdom of Portugal, the Kingdom of Sardinia, the Kingdom of Naples and the Kingdom of Sicily - as well as all the other Italian states) waging war against Revolutionary France, fearing that democratic ideas would spread amongst the continent and tear down their realms. France’s only major allies are the Batavian Republic and the Polish Legions. As for Switzerland, it isÔÇ� neutral. Dans la position militaire des deux armées, une suspension d'armes est toute contraire �á l'armée française, mais si elle doit �¬tre un acheminement �á la paix tant désirée et si utile aux deux peuples, je consens sans peine �á votre désir. La République française a manifesté souvent �á Sa Majesté l'Empereur son désir de mettre fin �á cette lutte cruelle, elle persiste dans les m�¬mes sentiments, et je ne doute pas après la conférence que j'ai eu l'honneur d'avoir avec vous que sous peu la paix ne soit enfin conclue entre Sa Majesté et la République française. In the military position of the two armies, a suspension of arms is totally contrary to the French Army, but if it must be a pathway to the peace so much desired and so useful to the two people, I agree without effort to your desire. The French Republic often expressed to His Majesty the Emperor its desire to put an end to this cruel fight, it persists in the same feelings, and I do not doubt after the conference only I had the honour to have with you that soon peace be finally concluded between His Majesty and the French Republic. 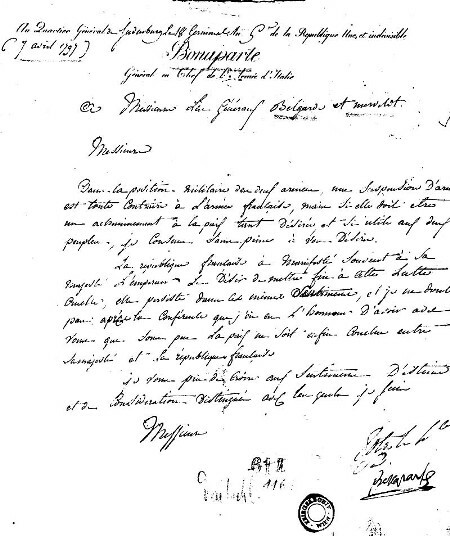 Six days after he had sent this letter, the two generals present themselves to Bonaparte’s head-quarters, as representatives of the Emperor, announcing the latter’s desire for peace. General Bonaparte, true to his word, then grants a suspension of arms, and the Peace Treaty of Loeben is signed only five days later, on the 18th�áof April 1797. 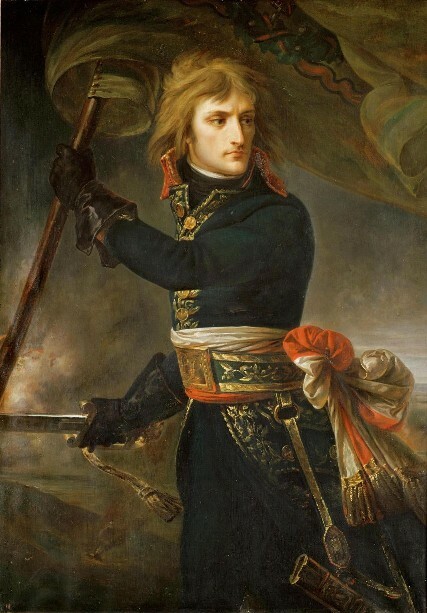 General Bonaparte is subsequently criticized and even blamed by many including, the Directory (the body representing the executive power in France), for having stopped conquering Europe and for being so kind to the House of the Austria with the terms of the Peace Treaty, which still represents a powerful potential enemy for the Republic, and could have been, in their opinion, easily brought down to its knees by the French army had General Bonaparte wish to conquer it. “Avons-nous tué assez de monde et commis assez de maux �á la triste humanité? Faut-il pour les seuls intér�¬ts de l’Angleterre que nous continuions �á nous entr’égorger ? “Did we kill enough people and commit enough evils towards the sad humanity? Must we, for the only interests of England, continue to slaughter each other? In the meantime, a violent insurrection occurs in Venice during Bonaparte’s absence. When he learns about it, the General is furious of what he calls a treachery! The senate sends envoys to calm him down and, caring about the welfare of the people, Bonaparte declares, ignoring the greetings of the scared envoys: “Are the prisoners at liberty?! I will have them all! All! All who are in prison on account of their political sentiments. I will go myself to destroy your dungeons on the Bridge of Tears -opinions shall be free- I will have no inquisition. If all the prisoners are not set at instant liberty, the English envoy dismissed, the people disarmed, I declare instant war. I might have gone to Vienna if I had listed -I have concluded a peace with the emperor- have eighty thousand men, twenty gun-boats. I will hear of no inquisition, and no senate either! ”. The threat isn’t sufficient, and after fighting for a few weeks, peace is imposed on Venice by early June 1797, with certain conditions, as a temporary government is created. Indeed, General Bonaparte specifies that the French troops would remain as long as it would take in order to protect the peace in the state. The various pacification attempts of Napoleon Bonaparte will prove to be successful, and on the 17 October of the same year, the peace Treaty of Campo-Formio is formally signed. Belgium, the Southern Netherlands and part of the Republic of Venice are ceded to France, while the other part of the latter is given to Austria. As for the Rhineland and most of Italy, they go under French control. As only Great-Britain remains an enemy of the French Republic, the peace treaty so much wanted by General Bonaparte brings an end to the First Coalition, which finally collapses after five restless years of war. Napoleon Bonaparte isn’t Emperor yet, but simply a general. His strong and genuine belief in peace will however remain with him throughout his life, as this paper intends to demonstrate. Early 1800: over two years have passed and Europe is now in the midst terrible battles, perhaps incorrectly named War of the Second Coalition. Indeed, it really should have been named World War I. As European monarchs have once again allied themselves to fight the ideas and the influence of the Republic, only this time, they are joined by the entire Ottoman Empire, as well as the United-States, against France and its allies. The war is on the land, as well as at sea. One of France’s foes there is the United-States, in an undeclared so-called “ quasi-war ”. Although it has more enemies, the Republic also has more allies, such as Spain, Denmark-Norway, and the Helvetic (Swiss) Republic, one of its client states. Mon général, je suis f�óché que les circonstances de m'ayent pas permis de faire votre connaissance. Je vous prie, mon général, de permettre que je vous offre un sabre que j'ai conquis en �ëgypte sur les barbares et de le recevoir comme une preuve de la considération toute particulière que m'a inspirée le courage de votre armée aux champs de bataille de Marengo. J'y joins, mon général, le désir bien sincère de voir bientôt nos deux braves nations réunies et terminer une guerre qui n'est utile qu’aux marchands anglais qui ne valent pas que tant de braves gens s'égorgent pour leurs intér�¬ts. Je désire fort, mon général, pouvoir �¬tre bon �á quelque chose. My general, I am annoyed that the circumstances did not allow me to make your acquaintance. I pray you, my general, to allow that I offer you a sabre that I have conquered in Egypt on the barbarians and to receive it like a proof of the very particular consideration that was inspired to me by the courage of your army to the battle fields the Marengo. I add to it, my general, the truly sincere desire to see our two brave nations united and to finish a war which is only useful for the English merchants who are not worthy of so many good people slaughtering each other for their interests. I strongly wish, my general, to be able to be good for something. General von Melas, however, keeps fighting. On 14 June, as he attacks by surprise the First Consul’s reserve army in the field of Marengo, von Melas is certain to win: not only are his troops more numerous than the French, but he has more than a hundred canons, while the Napoleon only has 15! 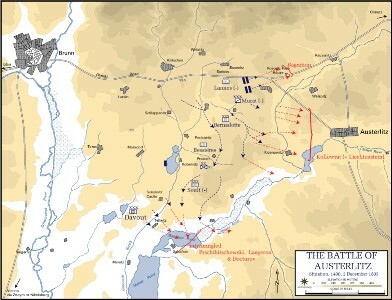 General von Melas then decides to leave the battlefield and go to announce his victory to the Austrian Emperor. As he is replaced by a subordinate, and as the French General Desaix arrives with reinforcement, Bonaparte wins the battle of Marengo, one of France’s major victories during this war. The first Consul then leaves for Paris and sends an envoy the next morning to the Austrian headquarters. There, von Melas starts negotiations with them, the Convention of Alessandria is signed, and north western Italy is transferred from Austrian to French control. On 30 September of the same year, the Convention of 1800 is instigated and signed, in Paris, by France and the United-States, with article 1 stating that: “ There shall be a firm, inviolable, and universal peace, and a true and sincere Friendship between the French Republic, and the United States of America, and between their respective countries territories, cities, towns, and people without exception of persons, or places ”. 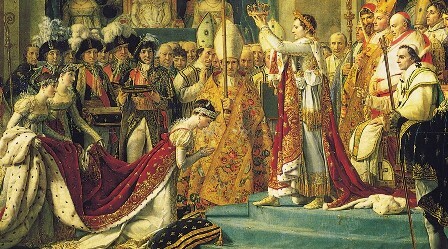 Following the Convention of Alessandria, the Peace of Lunéville was signed on 9 February 1801 between the French Republic and the Holy Roman Empire, effectively putting to an end the Second Coalition, with only England remaining, as Napoléon Bonaparte would later call it, his “ best enemy ”. The Peace of Amiens would later be signed between the two countries, on 27 March 1802, finally bringing peace to Europe. This would unfortunately only last for about a year. Appelé au trône par la Providence et par le suffrage du sénat, du peuple et de l'armée, mon premier sentiment est un v�ôu de paix. La France et l'Angleterre usent leur prospérité, elles peuvent lutter pendant des siècles; mais leurs gouvernements remplissent-ils bien le plus sacré de leurs devoirs? Et tant de sang versé inutilement et sans la perspective d'aucun but ne les accuse-t-il pas dans leur propre conscience? Je n'attache point de déshonneur �á faire le premier pas; j'ai assez, je pense, prouvé au monde que je ne redoute aucune des chances de la guerre; elle ne m'offre d'ailleurs rien que je doive redouter : la paix est le v�ôu de mon c�ôur; mais la guerre n'a jamais été contraire �á ma gloire. Je conjure donc Votre Majesté de ne pas se refuser au bonheur de donner elle-m�¬me la paix au monde, qu’elle ne laisse pas cette douce satisfaction �á ses enfants ; car enfin il n’y eut jamais de circonstance ni de moment plus favorables pour faire taire toutes les passions et écouter uniquement le sentiment de l’humanité et de la raison. Si Votre Majesté veut elle-m�¬me y songer, elle verra que la guerre est sans but, sans aucun résultat présumable pour elle. Quelle triste perspective de faire battre les peuples seulement pour qu’ils se battent ! Le monde est assez grand pour que nos deux nations puissent y vivre ; et la raison a assez de puissance pour qu’on trouve moyen de tout concilier, si, de part et d’autre, on en a la volonté. J’ai toutefois rempli un devoir saint et précieux �á mon c�ôur. Que Votre Majesté croie �á la sincérité des sentiments que je viens de lui exprimer et �á mon désir de lui en donner des preuves. If Your Majesty wants to think of it himself, he will see that the war is without goal, without any presumable result for him. What a sad prospect to make people fight only so that they fight! The world is big enough so that our two nations can live there; and the reason has enough power so that one finds the means to reconcile everything, if, on both sides, one has the will. I however fulfilled a holy and precious duty to my heart. May Your Majesty believe in the sincerity of the feelings that I have just expressed to him and in my desire to prove him so. «His Britannic majesty has received the letter which has been addressed to him by the head of the French government, dated the 2d the present month. There is no object which his majesty has more at heart, than to avail himself of the first opportunity to procure again for his subjects the advantages of a peace, funded on bases which may nut be incompatible with the permanent security and essential interests of his dominions. Conformably to this sentiment, his majesty feels it is impossible for him to answer more particularly to the overture that has been made to him, till he has had time to communication with the powers on the continent with whom he is engaged in confidential connexions and relations, and particularly the emperor of Russia, who has given the strongest proofs of the wisdom and elevation of the sentiments with which he is animated, and the lively interest which he takes in the safety and independence of the continent. By the time this letter is written, the Russian empire, the Holy Roman Empire, the Kingdom or Naples and the Kingdom of Sweden would soon join arms with the United Kingdom (under the instigation of William Pitt the Younger, who will be financing it) against the French Empire, the Kingdom of Spain, the Kingdom of Bavaria, the Kingdom of Württemberg, the short-lived Kingdom of Etruria, the Kingdom of Italy and the Batavian Republic. Chances of peace being effectively ruined, it would take another eleven months for Napoleon to bring peace in Europe again, through what will remain Napoleon’s greatest victories, the Battle of Austerlitz. 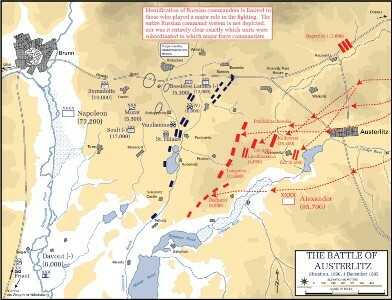 The battle of Austerlitz was the first battle where Napoleon could really choose the ground, bring the enemy to it, and finally impose his plan to the latter. On the evening of 1 December, the emperor already knows that the battle is won before it even started, and therefore that peace is near. He even confides to an aide-de-camps that this is the best evening of his life. On 2 December 1805, after nine hours of fierce fighting, and at the exact date of the first anniversary of his coronation, Napoleon vanquishes at Austerlitz both the Holy Roman Empire and the Russian Empire, whose common army had been one of France’s greatest enemy during this war. 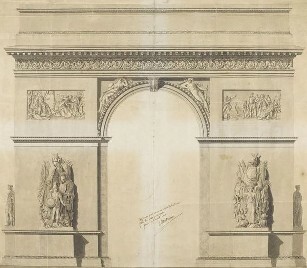 Napoleon will commemorate the major success that was the victory at the battle of Austerlitz by ordering the building of the Arc de Triomphe in Paris (which will be inaugurated thirty years later). The Emperor, very pleased by his soldiers, will reward them with high salaries, giving important pensions to their widows, and by personally adopting their orphans, allowing them to add “ Napoleon ” to their names and having the State pay for their education. The Treaty of Pressburg, signed as a result from the victory, will put a definitive end to the Third Coalition as well as to the nearly millennium-old Holy Roman Empire and will generate the creation of the Confederation of the Rhine, whose “ Protector ” will be no other than Napoleon himself. Finally, the peace treaties of Campo Formio and of Lunéville will be reinforced. June 1807: more than a year has passed and Europe is once again at war, as a Fourth Coalition has already been formed a year earlier. 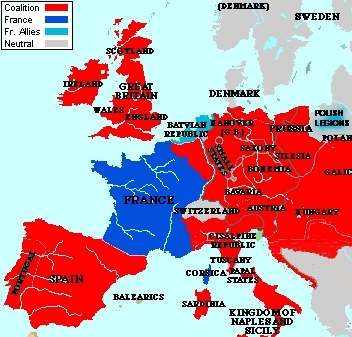 For the first time though, the coalition countries are outnumbered by those of the allies of the French Empire. Indeed, while the Kingdom of Prussia, the Russian Empire, the United Kingdom, the Kingdom of Saxony, Kingdom of Sweden and that of Sicily have basically waged war against the French Empire and its allies, it really was engaged in battle against the rest of Europe, that is the French Empire, the Confederation of the Rhine (which includes the Kingdom of Bavaria and that of Württemberg, the Polish Legions (once again our allies), the Kingdom of Italy, the Kingdom of Naples, that of Etruria, the Kingdom Holland, The Swiss Confederation (which was by then a client state of France, therefore not able to remain neutral in such a conflict) and last but not least, the Kingdom of Spain. By 14 October 1806, after Napoleon’s victory at the battle of Jena-Auerstedt, Prussia was already out of the picture, and was to remain subjugated to the French Empire until the creation of the sixth coalition more than five years later. 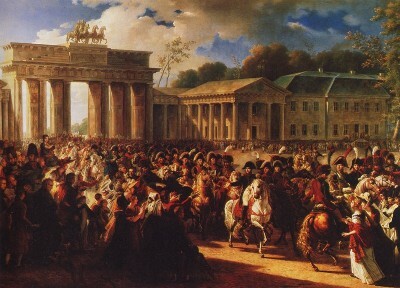 Less than two weeks after his victory, the French emperor and his army enter Berlin, on 27 October 1806. After several unsuccessful attempts to persuade the Tsar to cease the battle, Napoleon manages to defeat the Russian army at the battle of Friedland on 14 June 1807 after one day of continuous fighting. Napoleon, able to erase Prussia from the map by utterly destroying its army, once again decides to sign a peace treaty with it. Consequently, two separate agreements are signed by Napoleon the�á on the following month, in the town of Tilsit. The first one is signed with Tsar Alexander I of Russia on 7 June, successfully establishing peace with the Russian Empire, and the second one is signed with the Prussia on 9 June. Prussia considers the Treaty of Tilsit a public humiliation, as the latter establishes the creation of the Duchy of Warsaw and of the Kingdom of Westphalia, hereby effectively depriving the Prussian kingdom of half of its dominions. Prussia is nevertheless eager to sign it, considering the alternative. The two treaties of Tilsit therefore successfully end the Fourth Coalition War. Many more peace letters have been written by the Emperor throughout his life, which, along with the many other actions taken by the latter attest of his true wish for world peace over war, up to the very end of reign. On 14 February 1813, not long before his exile to the island of Elba , while again at war with Russia, he will once more write to the Tsar: “ Je désire la paix, elle est nécessaire au monde ” (I desire peace, it is necessary to the world). This paper only outlines some of the numerous acts of clemency shown by Napoleon towards his enemies, and the displays of the profound desire for peace that has always been his throughout his life, in the hopes of displaying this mostly unknown aspect of his; that of the man who wrote of peace even en he was facing war. Ô�� BAINVILLE, J. (1931) Napoléon. Oxford: Fayard, 79. Ô���áBEAUVAIS DE PREVAUT, C. T. (1817) Victoires, Conqu�¬tes, Désastres, Revers et Guerres Civiles des Français, Tome 15. Paris: Pancoucke. Ô�� BONAPARTE, N. (1797) Lettre de Bonaparte aux Généraux Belgarde et Mervedt, Vienna War Archives. 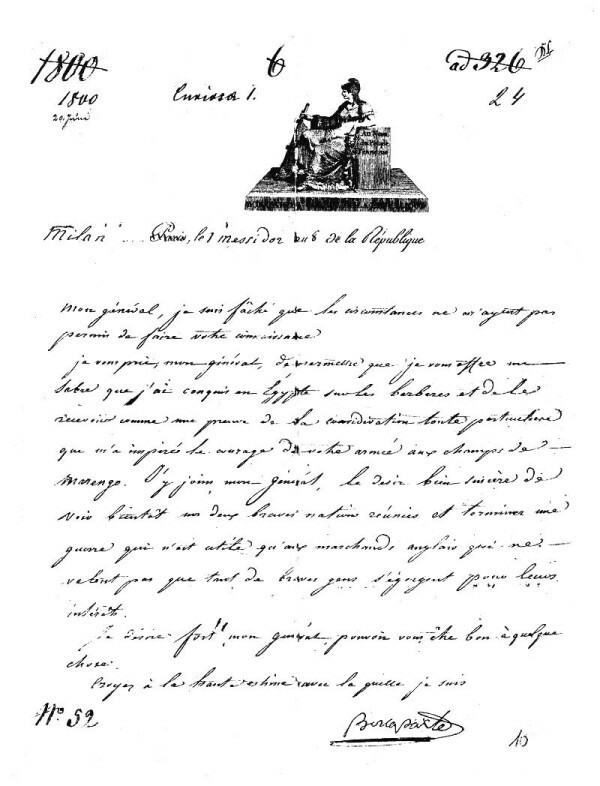 Ô�� BONAPARTE, N. (1800) Lettre de Bonaparte au général von Melas. Ô�� BONAPARTE, N. (1864) Correspondance de Napoléon Ier, Tome seizième, Paris: Plon, 187. Ô�� CHANDLER, D. G. (1973) Campaigns of Napoleon. New York: Scribner,�á 439. Ô�� CONNER, S. P., (2004) The Age of Napoleon. Westport: Greenwood, 48-49. Ô�� LALLEMENT, G. N. (1822) Choix de Rapports, Opinions et Discours Prononcés �á la Tribune Nationale Depuis 1789 Jusqu'�á ce Jour,�á Tome 6. Paris: Eymery. Ô�� MARTENS, G. F. von (1801) Recueil des principaux traités d'alliance, de paix, de trève, G�Âttinguen: Dietrich, 1801. Ô�� MCLYNN, F. (1998) Napoleon, A Biography. London: Pimlico, 93. Ô���á POTERFIELD, T. B., SIEGFRIEND, S. L. (2006) Staging Empire: Napoleon, Ingres, and David. University Park: Penn State, 4. Ô�� RUSSELL, W. (1836) The History of Modern Europe, Volume 3. New York: Harper, 398-401. Ô�� THIERS, A. (1846) Histoire du Consulat et de lÔÇÖEmpire, Tome II. Paris: Plon. Ô�� UFFINDELL, A. (2003) Great Generals of the Napoleonic Wars. Staplehurst: Spellmount, 15. Ô�� U.S. Military Academy, Battle of Austerlitz - Situation at 1800, 1 December 1805, The Department of History, United States Military Academy. Ô�� U.S. Military Academy, Battle of Austerlitz - Situation at 1400, 2 December 1805, The Department of History, United States Military Academy. Ô�� Various (1800) France - Convention of 1800: Text of the Treaty, Yale Law School, Lilian Goldman Law Library. Ô�� WOUTERS, F. (1847) Histoire Chronologique de la République et de lÔÇÖEmpire, Bruxelles: Wouters, 709. Ô�� WRIGHT, J. (1807) The Annual Register: 1805. London: Otridge, 616.